Having a Google Home Mini around is often an enjoyable, futuristic experience. But for some, it can feel bizarre saying things aloud to seemingly no one in particular and waiting for a disembodied Google Assistant to respond. Thanks to the wonders of 3D printing, you can make these encounters a little more palpable by giving that virtual assistant living inside your smart speaker an adorable Android robot body. 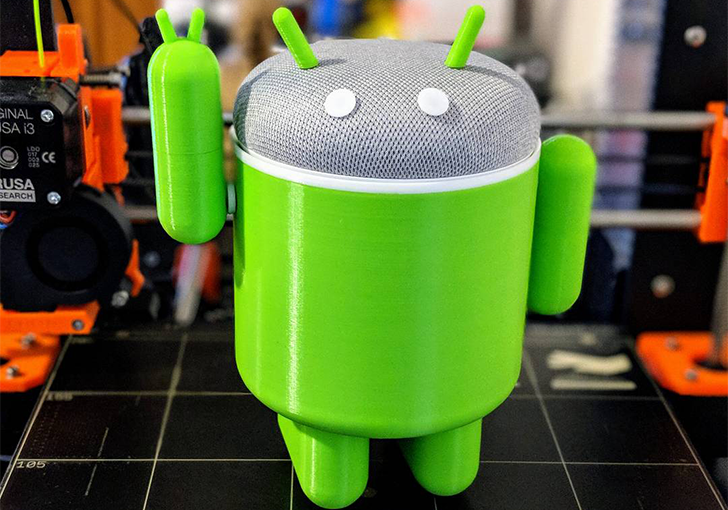 The STL files for this Google Home Mini body can be downloaded for free from Thingiverse or MyMiniFactory, courtesy of our reader Yaya. If you have a 3D printer, just print all the body parts and assemble the headless Android robot (there are tips on both of those download pages). If you don't have a 3D printer, you can upload these files to sites like Shapeways or 3D Hubs and let them take care of the rest. These sites give you plenty of materials to choose from, including metals. Once the 3D-printed body is assembled, top it off with your petite smart speaker, which is the robot's head. Just know that some hot glue is required to attach the eyes and antennae. Most Google Home Mini owners probably enjoy its understated form factor as a standalone device, but it's still a bit surprising that these fun frames or bodies aren't more prevalent. I'd wager there are a good number of kids, teens, and young-at-heart adults who would enjoy the hell out of these accessories, especially if they could take the form of beloved licensed characters. Of course, there are always DIY mounts for the Google Home Mini you can fashion with simple materials, but a talking Android robot seems way more fun to have around.